Come FEED your mind with FRID's new discussion group series coming soon! FEED stands for FRID Engaging, Evaluating, and Discussing! 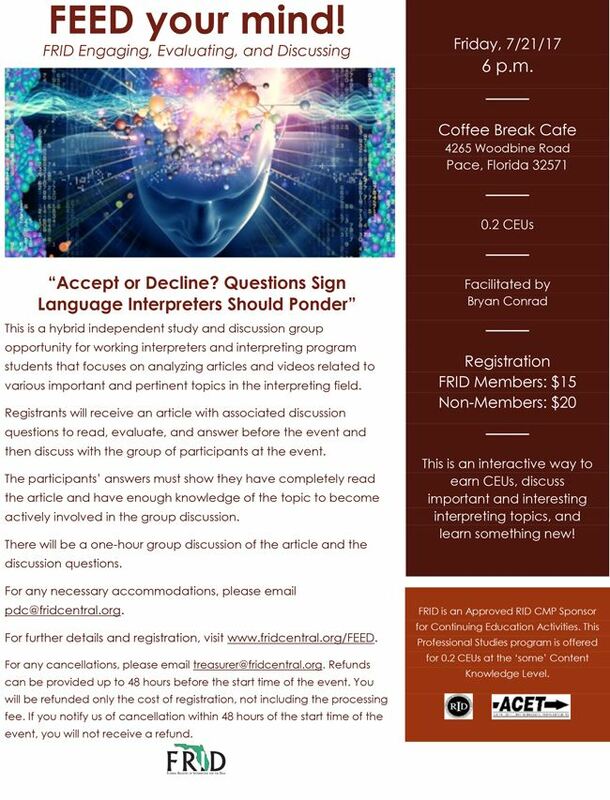 This is a hybrid independent study and discussion group opportunity for interpreters around the state of Florida. It is a CEU-earning workshop series that will be focused on analyzing articles and videos related to various important and pertinent topics in the interpreting field. You will need to register on FRID's website for the appropriate location and date of the discussion group that you want to attend. Once registered and paid, you will receive an email with the link to an article or video that you must read/watch before attending the event. Also in that email will be a document of discussion questions that will guide our group discussion. If you want to earn CEUs, it is required to answer the discussion questions and send the completed answers electronically to the designated FRID email address by midnight of the day before the event. For example, if the event itself is to be held on December 2nd, the discussion question answers must be submitted to the designated FRID email by 11:59pm on December 1st. If the answers are not submitted on time, you unfortunately will not be able to receive CEUs. Your answers to the questions must show that you have completely read the article and have enough knowledge of the topic to become actively involved in the group discussion. If your answers do not sufficiently reflect in-depth thought and consideration of the article, you will not be able to receive CEUs. Each discussion group will be held by a host who will be responsible for guiding the group discussion and monitoring participation of the attendees. At the event, attendees will be expected to use critical thinking skills to engage in thought-provoking, in-depth discussion of the article and the questions associated. FEED will be held in different locations all over the state of Florida. The articles will be hosted in rounds; this means that each article chosen will be hosted once in each location. Once that article has made its rounds to each location, then we will choose a new article, and so on. In addition to the face-to-face events, we will be incorporating online webinar discussions, so you can get CEUs without even leaving your home! CEUs will be offered! The amount of CEUs will vary depending on length and complexity of the stimuli. Costs will vary accordingly.